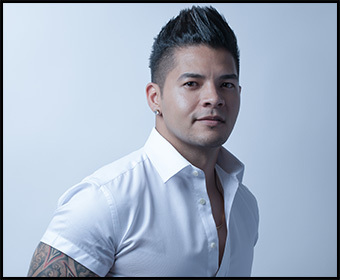 AJ Castillo '08 applies what he learned about business at UTSA to his Latin music career. (Nov. 29, 2017) -- Meet AJ Castillo ’08. He’s a Latin musician who’s applying what he learned about business at UTSA to his creative pursuits. Born in Austin, Castillo grew up in music venues. His father and uncle were part of a Tejano band, and Castillo started attending their shows when he was five years old. Castillo began playing the accordion when he was nine years old and continued developing his skill into high school. As a high school student, he became serious about pursuing a professional music career and played in several different bands. He wasn’t certain about attending college but was persuaded by his teachers that it could benefit his music career. He chose to study business management, knowing that as a young musician he could use those skills to further his career. Castillo credits his course work at UTSA with teaching him to work with people from different backgrounds with different points-of-view. He also learned how to handle the pressures of a career and how to manage his time. As a student at UTSA, Castillo began working with an award-winning San Antonio-based producer, Gilbert Velasquez, who had previously worked with Selena among many others. Castillo worked as a studio musician and also helped to arrange songs. He soon became anxious to work on his own music, especially in a city where Tejano music is so influential. Castillo graduated from UTSA in 2008 and has since performed at venues across the United States and gained a loyal, ever-growing fan base. Just two years after he graduated, Castillo won Best New Male Artist at the Tejano Music Awards. He’s become known for his custom accordions and enthusiastic live performances. Since 2009, Castillo has released five albums and two DVDs, with a new album due in early 2018. This year he collaborated with musician Juan Treviño on the song “Siempre Es Así,” which won a Latin Grammy for Best Regional Song earlier this month.